Habit: Perennial herb 5--25 cm, erect or decumbent, not bulbous-based; roots basal, not tuberous. Leaf: segment tips rounded; distal cauline much-reduced, deeply parted or compound. Flower: receptacle glabrous or sparsely long-hairy; sepals 5, spreading, 4--8 mm, 2--6 mm wide, early-deciduous; petals 5--8, 6--13 mm, 4--13 mm wide. Fruit: body 1.4--2 mm, 1--1.6 mm wide, lenticular, wall thick, smooth, beak 0.6--1.8 mm, straight but occasionally curved in youth, lanceolate or awl-shaped. Unabridged Note: 2 other varieties, not in California. Stem: caudex 2.5--4.5 cm, persistent leaf bases many. Leaf: basal 0.5--1.5 cm, 0.8--2 cm wide, reniform, shallowly 5--9-lobed or occasionally 3-parted, lateral segment again lobed, base truncate, middle segment unlobed, ultimate segments rounded or obtuse. 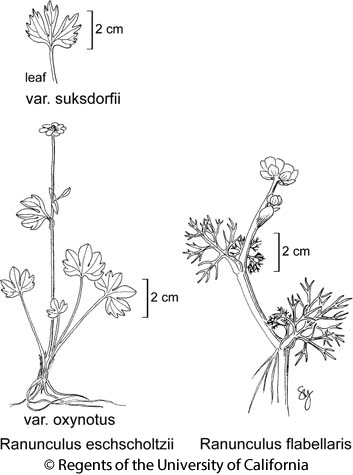 Citation for this treatment: Alan T. Whittemore 2012, Ranunculus eschscholtzii var. oxynotus, in Jepson Flora Project (eds.) Jepson eFlora, http://ucjeps.berkeley.edu/eflora/eflora_display.php?tid=64874, accessed on April 19, 2019. SNH, SnBr, SnJt, Wrn, SNE (Sweetwater, White mtns); Markers link to CCH specimen records. Yellow markers indicate records that may provide evidence for eFlora range revision or may have georeferencing or identification issues. Purple markers indicate specimens collected from a garden, greenhouse, or other non-wild location.